At the October rate-setting meeting the CBT kept all rates unchanged, in line with ING forecast and the unanimous consensus expectation. 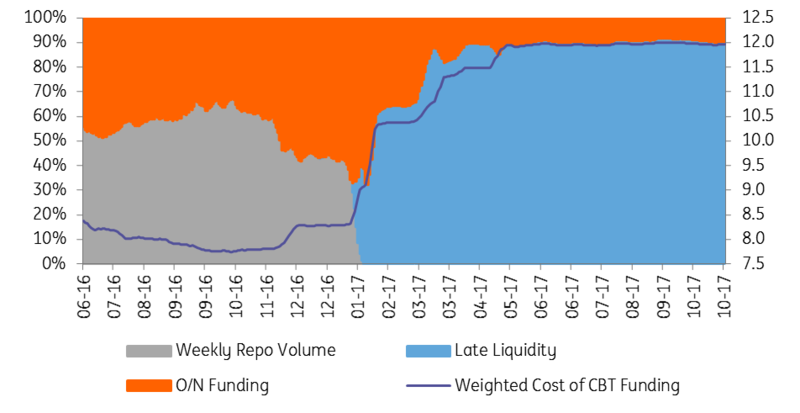 Accordingly, the late liquidity window (LLW) rate, the main channel for CBT funding (at 90% of the total), was flat at 12.25%, while the O/N borrowing rate, O/N lending rate and 1-week repo rate stood at 7.25%, 9.25% and 8.0%, respectively. 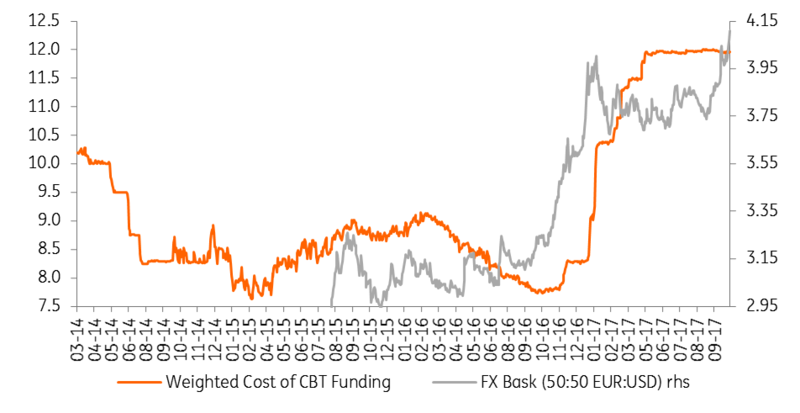 In other words, the CBT has maintained its defensive stance on the back of reviving inflationary pressures and ongoing stress on the currency with recently heightening geopolitical risks, pointing to the effective cost of funding to stay close to 12% in the near term. The announcement of the decision did not create any meaningful impact on the currency as TRY remained above 3.77 vs USD. Given the deterioration in headline inflation and core indicators, strong economic activity, as well as weakening pressure on the TRY in recent days, the CBT struck a more hawkish tone and signaled to prolong the ongoing hawkishness “decisively” until the inflation outlook “becomes consistent with the targets”. On the latest medium-term plan, the government envisaged lowering annual inflation to 7.0% next year and converging the target at 5% in 2020. Even if CPI inflation were to embark on a downtrend from Dec-17 onwards with large base effects, it is likely to remain above the target range next year, hinting that the CBT will refrain from an early easing given its concerns about the FX pass-through, and the deterioration in pricing behavior owing to the elevated level of inflation. There were also a few tweaks in the statement. First, after mentioning risks on the pricing behavior from the current inflation outlook in September statement, the CBT indicated that current outlook “continues” to pose risks. Annual inflation returned to double digits in August and increased further in September, attributable to a rise in goods inflation driven by food and core goods, while services inflation maintained a gradual uptrend, standing at its highest since the global crisis. Core inflation, meanwhile, increased to 11.0% in September, its highest reading since early 2004. This was due to the continued impact from the currency and strong economic activity, as core figures remained elevated with no clear sign of downtrend yet. On the growth side, the CBT now sees "strong economic activity” as evidenced by the latest high-frequency indicators, with robust PMI and IP prints as well as CUR and business confidence indicators. All in all, the CBT maintained its policy direction given rising inflation expectations and continued dollarization. It seems not only the pace of decline, but also the quality of improvement will be important for the bank. Accordingly, the CBT has become more hawkish and signaled that it would keep the current tight liquidity stance “decisively” until an inflation outlook consistent with the targets. So, robust real growth dynamics as well as stickiness in inflation expectations and ongoing currency pressures should continue to make the CBT refrain from early easing.